It is rare to find child burials from the Anglo-Saxon period. This is strange because children outnumbered adults and there was a high infant mortality rate. Archaeologists think that children may have been buried in a different way to adults, and the fragile bones of infants often do not survive long in the soil. In 2010, archaeologists began excavating a fifth to sixth century Anglo-Saxon cemetery in Oakington, just north of Cambridge. Excavators were surprised to find that this site contained an exceptionally high proportion of child burials. Nearly half of all the burials discovered belong to individuals under the age of twelve. Although the excavators were not looking for children, this discovery has provided a remarkable opportunity to use modern research techniques to ask new questions about children’s lives in Anglo-Saxon Cambridgeshire. In the Oakington burial ground, 27% of the 128 excavated burials were of children under the age of six. Many of the burials contained small vessels. Researchers are now analysing these in the hope of identifying their contents. This may help us understand more about the young children who were buried with them. For more information about the research project undertaken by the University of Central Lancashire, Manchester Metropolitan University and Oxford Archaeology East have a look at the Bones without Barriers project website. This infant’s burial contained a single pot but no other grave goods. This small vessel was found in a child’s grave alongside a single animal bone. 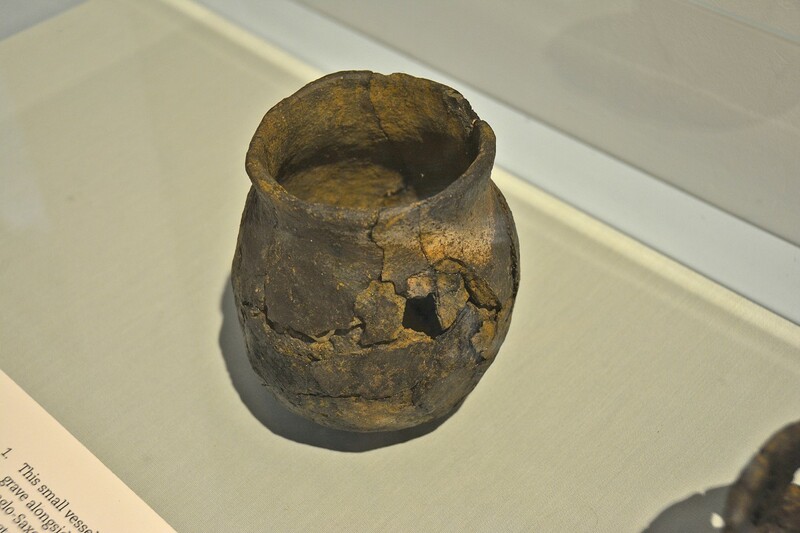 This complete pot was the only artefact found in the infant burial.